If Donald Trump and his campaign won the 2016 election fair and square without any cheating or rigging, they should theoretically have nothing to fear from the upcoming recounts in the states of Wisconsin, Michigan, and Pennsylvania. He officially “won” those states by large enough margins that the only way the could lose the recounts if he and his team outright rigged the vote totals in those states. And so his apoplectic reaction to the recounts today raises the question of what he has to hide. And now he’s claiming that three random states were rigged against him as he tries to distract the public from whatever is about to be exposed. After a day and a half of nonstop ranting about the recounts on his infamous Twitter account, Donald Trump finally reached his crescendo on Sunday night when he declared “Serious voter fraud in Virginia, New Hampshire and California – so why isn’t the media reporting on this? Serious bias – big problem!” He went on to offer no evidence to support his claim that any voted fraud took place in any of those states. Moreover, he lost California in a massive blowout, and no Republican ever contends in a presidential election in California to begin with. 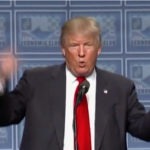 But nonetheless, Trump’s official stance on the recounts appears to be that of ‘Hey don’t look over there, look over here.’ Even as the recounts are about to get off the ground in the three states where evidence of cheating in his favor actually does exist in spades, he’s hoping to shift the public’s focus to three other states he happened to lose. Considering Donald Trump’s penchant for accusing his opponents of whatever he’s caught doing himself, and his sudden unsubstantiated accusations of cheating against three states, it will lead skeptics to conclude with even more certainty that it’s a sign he is indeed guilty of cheating himself. And here come the recounts.